Got a glitchy photo? Don’t give up! You’ve got a photo that looks great on the camera display, but when you open it on your computer the image looks ruined, as if someone applied a glitch effect to it. Don’t panic! You might be able to save the picture. The 2014 release of Adobe Creative Cloud significantly updates the entire range of Adobe applications and services. I’ve collected some practical tips and information that you might not be seeing on the new feature lists. You can watch a recording of the Adobe announcement event (June 18, 2014). In the picture of my Adobe Creative Cloud desktop application above, you might notice that Photoshop is listed three times. What’s that all about? One reason that updates are also listed for some CC and CS6 applications like Photoshop is because Camera Raw 8.5 became available at the same time and is compatible with those applications. 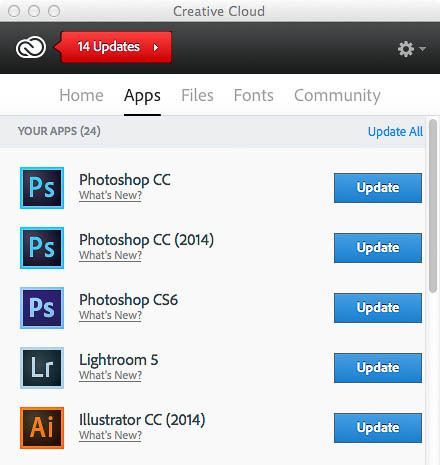 When you see the long list of new and updated software in the Creative Cloud desktop application, it’s tempting to just hit the Update All button. But before you dive into all the new hotness, there are a few things you should know and be prepared for. I strongly recommend reading Installing the 2014 Release of Creative Cloud by Julieanne Kost, and 2014 release of Photoshop CC: FAQ by Jeff Tranberry. I highlighted some of the issues below. CC 2014 versions install separately. I just mentioned that CC 2014 applications are installed in addition to CC applications, so you’ll end up with two versions. This is confusing a lot of people. For example, you may need to uninstall your old CC versions and delete old Dock (OS X) or Taskbar (Windows) shortcuts, add new shortcuts for the CC 2014 versions, and make sure your add-ons still work (see next item). Plug-ins and extensions apparently missing (but not really). Because CC 2014 applications install separately, they may not see your plug-ins and extensions if those are stored in folders for an earlier version of Photoshop. You may have to drag over those add-ons to the appropriate CC 2014 folder, or reinstall them. Removed features. Back in April, Adobe warned us that some features would be removed in the next version of Photoshop, and Photoshop CC 2014 is that version. Before you uninstall any old CC apps, test your workflow in CC 2014. Most of the features removed from Photoshop are related to the Pixel Bender technology (no longer developed) such as Oil Paint, and panels and extensions based on Flash such as Mini Bridge and other Flash-based extensions (including those made with Configurator). Also, Photoshop CC 2014 doesn’t support OS X 10.6.8 Snow Leopard. Horizontally oriented dialog boxes. You may see some Photoshop CC 2014 user interface changes such as dialog boxes that are redesigned with a horizontally oriented layout. This was done to better fit dialog boxes to today’s widescreen displays, particularly those on lower-resolution widescreen laptops where the old tall dialog boxes could get cut off. File Info redesigned. You might notice that the File Info dialog box looks different in Photoshop CC 2014. I believe this is because File Info was Flash-based in previous versions, so the dialog box was rebuilt due to the removal of Flash-based components. You can also monitor the Adobe user forums for emerging issues with the CC apps you use the most. If you need to download Adobe application installers instead of installing with the Creative Cloud desktop application, as usual ProDesignTools has a list of download links for each application. Be sure to follow the instructions exactly, otherwise you’ll get an error. When Creative Cloud was originally introduced, the services were promising but incomplete. Though there are still some glaring holes, they’re gradually becoming more useful. Lightroom sync expands. Lightroom Mobile now syncs Lightroom on the desktop with Lightroom on iPad and iPhone as well as the lightroom.adobe.com web view, and the Adobe Voice app for iPad can now get images from Lightroom synced collections. The growing reach of Lightroom Mobile sync is leading more users to point to the elephant in the room and ask: How soon will LIghtroom be able to sync catalogs between a desktop and laptop? Folder sharing enabled. The ability to share a folder from Creative Cloud online storage is significant. Previously you could only share individual files, which seriously limited the value of your Creative Cloud shared storage. Being able to share folders removes that limit and makes Creative Cloud file sharing much more useful, especially for sharing Adobe file formats. But Creative Cloud file sharing still isn’t as widely supported by applications and devices as Dropbox, Box, Google Drive, or Microsoft OneDrive. Behance more tightly integrated. The Behance service is being tied into more Creative Cloud desktop and mobile applications as Adobe grows this creative online community of conversations and feedback about both portfolios and works in progress. For example, the new Adobe Sketch and Line apps for iPad are both intended to use Behance as a place to both store and show off the work done in those apps. Royalty-free assets coming soon. Adobe talked about adding access to a new library of royalty-free assets, but it isn’t available yet. This won’t be the first time they’ve tried this; I remember Adobe Stock Photos. Although the new service will probably go well beyond photos. Typekit support expands. Access to thousands of Typekit fonts is one of the most immediately useful Creative Cloud services, and more Creative Cloud applications now have access to them, notably Photoshop. I didn’t completely cover changes to all of the applications, the new range of mobile apps and hardware, and the very interesting Adobe Creative SDK, but when you throw all that in with the application upgrades, with the 2014 release we’re starting to see the larger and longer-term vision that Adobe has for Creative Cloud. You’ve got a folder full of images and you need to run some production chores on them, like converting formats or applying noise reduction. How can you quickly tell which images need work? 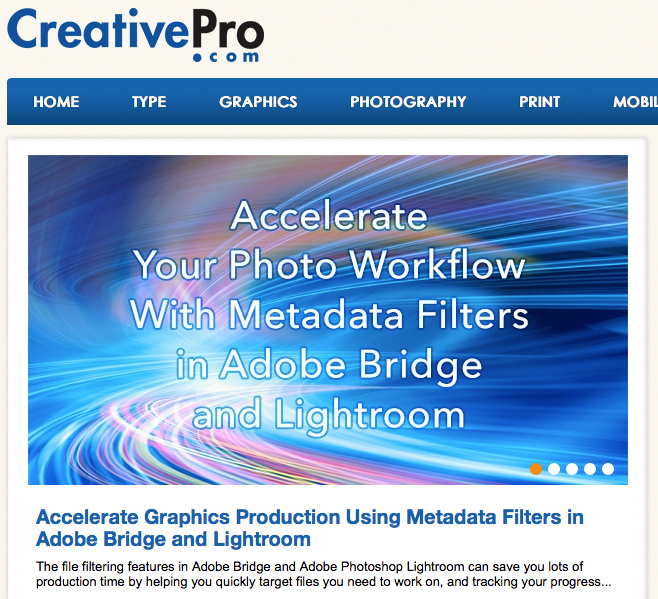 In an article I wrote for CreativePro.com, I talk about how the filtering features in Adobe Bridge and Adobe Photoshop Lightroom can save you lots of production time by helping you quickly target files you need to work on, and tracking your progress.